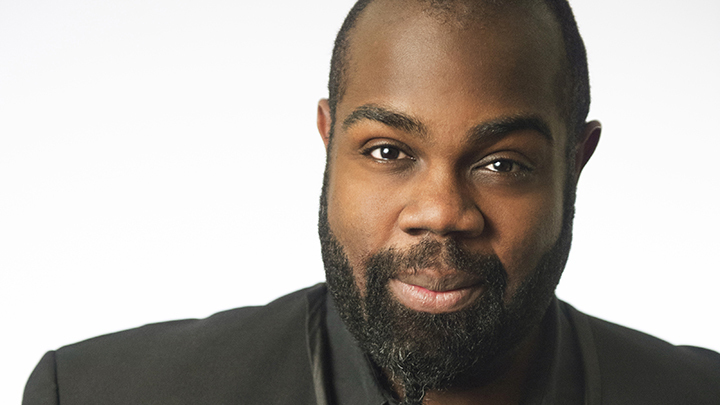 Reginald Mobley makes his Seattle Symphony debut on February 24 & 25. Reginald (“Reggie”) Mobley is a countertenor, which means his vocal range is equivalent to those of female altos and mezzo-sopranos. He also shares his voice type with stars like Michael Jackson and Prince. “It must be said from the beginning that one of the joys of seeing Mobley is hearing his beautiful alto coming out of a big, tall man who looks more like a linebacker for the Miami Dolphins than the P.G. Wodehouse party guest his name might suggest,” writes one reviewer. Mobley, who originally trained as a visual artist, is highly sought after for the crystalline, pure tone of his voice. An expert in Baroque and Classical performance, he has sung with distinguished ensembles in the United States and Europe. He’s known for his original approach to these classics of the vocal repertoire. Mobley is “confidently fleet of foot in his runs, occasionally imparting a surprisingly plausible jazz inflection,” writes The Independent. Mobley spoke with us ahead of his debut appearance with the Seattle Symphony on February 24 and 25. What misconceptions do you encounter as a countertenor? I still come off as a shock to many audiences. Singers like Paul Robeson, Willard White, Kevin Deas, Eric Owens and my friend Ryan Speedo Green have set and sustained a precedent that large black men are the standard for subwoofer shattering voices of God. I imagine that upon first hearing me, people sit in the halls waiting for me to step aside and reveal a smaller mezzo-soprano or Dickensian waif of a countertenor! How did you get your start singing? It's a stereotype that all Black classical singers from the Deep South started out singing in their church gospel choir, but in my case, the stereotype is true. I grew up singing behind the pulpit at Bethel SDA Church in the predominately Black southeast side of Gainesville, Florida. I picked up the trumpet in middle school. I looked like a mini Dizzy Gillespie. It turns out we were born on the same day, October 21. I fell into more singing my last two years of high school after the chorus teacher went on a caffeine-fueled hunt for more boys to sing in the choir. You were originally going to be a visual artist. What inspired you to pursue music? Art was my passion, and through it my work eventually bloomed in the form of a scholarship offer from a small college in North Carolina. Unfortunately, every rose has its thorns. I found carpal tunnel syndrome part of the harvest. Through the hard work of my mother, guidance counselor and the chorus teacher, we found a school that was willing to match my art scholarship offer with one for music. Oakwood University provided the stage for my rapid left-turn. Do you have any advice for young musicians today? Absolutely! Even though ego seems to have commanded such an important role throughout the course of human existence, music has no ego. Music doesn't serve itself. It exists as both a gift and a service. If we're to be the best possible musicians we can be, we must learn openness, humility and integrity. They will grant you the clarity to define your own standards of success. If that results in you owning a private jet, or only a toothbrush, you'll have done it right if it's what you want. There are many paths up the mountain. This is mine. What do you enjoy doing off stage? I read a lot of comics. Doctor Fate and Wonder Woman are my absolute favorites, with Wonder Woman being the greatest of the two. I daresay I'm obsessed with her. Nothing pleased me more than when the UN declared my birthday as International Wonder Woman Day! Why do you love singing? It’s the joy of knowing that what I do can make a difference in someone’s life on many different levels. And no one can explain how or why it works. Reginald Mobley performs music by Bach and Handel with the Seattle Symphony at Baroque & Wine on February 24 and 25.